In order to collect data, my healthcare provider uses different systems to gather data. For example, some data is entered by filling out forms while other data pours in during a blood test. Getting accurate data about patients is becoming easier with improving software, and systems that collect a robust amount of data. Within the credit union industry, data collection is relatively easy. Members are feeding data to software systems on a daily basis. Rather than a once-a-year checkup, members are checking in daily with every transaction they conduct! Behind the scenes, all of this data is integrated into a Single Version of the Truth (SVOT). Integrating all the different systems at a clinic is vital when supporting holistic health. Imagine if your clinic did not know that you had a major surgery because it was conducted by a hospital that used a system that was not integrated into the clinic. Likewise, credit unions must develop a holistic picture of their member’s financial health through an industry standard analytic data model (ADM). If credit unions only rely on their core data, they might see that a member has a credit score of 720 and $5,000 in their share account. Decision-makers are not be in a good position to assess this member’s overall financial health. Just like going to the doctor, financial consumers are able to quickly go on a diet or stop unhealthy behavior in order to skew data uncovered during their check-up. However, lurking beneath the core data of the member could be spending behaviors that make them riskier than their credit score and share account balance indicates. My healthcare data is available in a BI portal for me to view anytime. Visualizing data is very powerful. Seeing data about health can be a wake-up call for many patients. Knowing that cholesterol levels went up is one thing, seeing a line chart with a steep gradient is another. In the same way, when a member is able to interact with dashboards and charts of their spending/savings data, they will be able to change their habits in order to correct the problem that has been unveiled through interactive data visualizations. A holistic view of a member allows credit unions to develop products and services tailored for individual members’ current condition. Displaying powerful data visualizations for members will allow them to navigate their financial journey more smoothly. Just as it is wise to assess overall health at least once a year, credit unions should give their members a report on their financial health every year using an algorithm to include different financial ratios (i.e. Debt-to-Income, Net Worth, Spending Behaviors, etc.) along with member defined goals (i.e. buying a house in two years). Developing models that can automatically detect any illness will help members avoid behaviors that would have prevented them from reaching their goals. Displaying this data as a scorecard will give members a crystal clear view of where they stand compared to their goals. Utilizing a BI portal through a mobile app or online banking website, credit unions can prescribe the best methods of curing financial illnesses and bring members back to full health. With the assistance of industry experts and analytics, healthcare systems are beginning to develop prescriptive analytics. Prescriptive analytics provide the solutions rather than just reporting on what has already happened (Descriptive Analytics) or what might happen (Predictive Analytics). Prescription has been a common term in healthcare for a long time. Now, credit unions can develop similar models for their members that prescribe methods to improve their financial health. Members have a limited amount of money and many ideas of what they want to do with it. Helping them make data-driven decisions to optimize their finances is essential when assisting them in optimizing their financial health. Giving members timely and relevant recommendations (through the appropriate channels) will continue to bolster the spirit of “people helping people” that the credit union movement was established on. The credit union’s data revolution is only beginning. 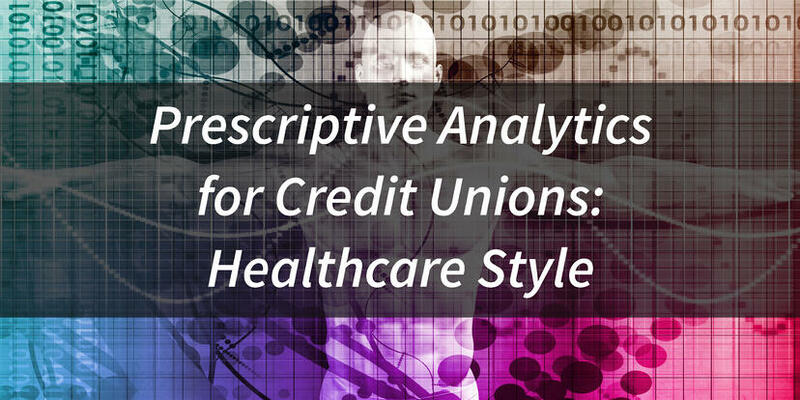 As credit unions continue to cooperate on analytics, they will improve the financial health of members around the world.